By Arden Moore, a certified dog and cat behaviorist with the International Association of Animal Behavior Consultants. Arden is an author, radio host, and writer for Pets Best, a nationwide puppy and dog health insurance agency founded in 2005. Sit. Stay. Lie down. Come. Good puppy! What’s the secret to training your newly adopted puppy to ensure that he will master these must-know cues? Two words: positive reinforcement. Puppies, just like us, are more eager to learn when the teacher makes the lesson fun and engaging. So, out with the word, “no” and in with the word, “yes.” Accentuate the positive in schooling your pup. And most importantly, canine class should begin on day one. 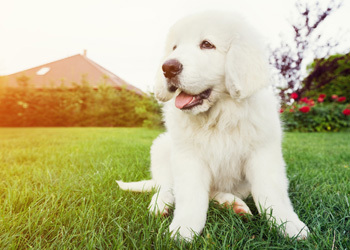 Learn more tips to prepare for a new pet with the Pets Best New Dog Owner’s Guide. 1. Ahem: Attention, please! Some puppies can get distracted easily. The only way to get your pup to successfully comply with your training is if you have his undivided attention. So, when you begin any training session, pick a place and a time where distractions are kept to a minimum. When you’re ready, say your pup’s name and wait for his eyes to meet yours. Clap your hands or whistle if you have to, but make sure he is watching you and waiting for his cue to see what to do next. 2. Be a leader, not a bully. No need to shout or berate your young canine. You will win his unconditional loyalty by being an effective teacher who relies on positive reinforcement techniques. Praise your pup’s correct moves and ignore his mistakes during training sessions. Dogs learn by association and are apt to repeat an action when it is reinforced by you in a positive manner. 3. Give me a C — for consistency. Decide on what verbal and physical cues you want for the must-know canine cues of “sit,” “lie down,” “stay,” and “come.” And then, stick with them. If you use the command, “stay” in one training session and then “don’t move” in the next, you will create canine confusion. If you’re consistent with the cues, your puppy will eventually catch on. 4. Speak properly. When you teach your pup the essential basic cues, make sure the tenor of your voice is friendly, confident and encouraging. If you project frustration or impatience, those emotions can make it harder for him to learn. 5. Stick with tiny treats. Training time should be a pleasant experience for your puppy, so that’s why using treats works so well. However, keep those tasty tidbits tiny enough for him to bite once and swallow. You’ll keep his attention on you by using small treats, rather than becoming distracted by consuming a large treat. 6. Keep lessons brief. Puppies tend to learn better in training segments that are 10-minutes or less. These mini-training sessions also work better for you since they fit easily into your busy schedule. For example, you can squeeze in a short training lesson before you head off to work or when you get home after a long day. Parting tip: Your pup needs and deserves plenty of structured training, so be sure to enroll the both of you in a puppy obedience class taught by a professional dog trainer who subscribes to the positive reinforcement training approach. Get answers to your pet training questions from a veterinary expert! Learn more about the Pets Best 24/7 Pet Helpline!